G'day from down under or the antipodes if you prefer. Hi Joyce, and those have still to post. Joyce and Tom and all who follow!! There is still time to submit responses to the 3&4 poozle. A few have commented that it is easier than usual. Sorry I missed out on greeting you tom from Vancouver, you are in a lovely part of the world there. Oh, happy day. The sun is shining. 2:13 A bit slow again tonight. Good Maen from Texas! Class in 8 minutes - guess I better get ready. I am waiting for a break in the weather to get out and do the grocery shopping. Nothing too bad, just a steady rain. No wind. 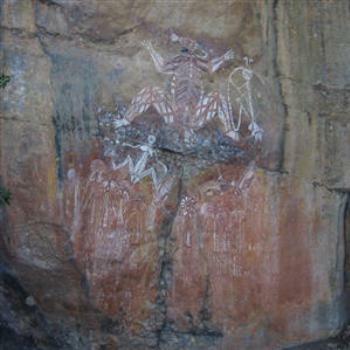 It was an example of such a hieroglyph that I found interesting, among many other things, on the program 'Outback' on PBS. Wendy for an interesting pictograph photo. Oh, great, we dodge the hurricane and now have a tornado warning! I hope that avoids this area, too, or never materializes at all, even better. Too busy enjoying day 2 to come by. It sat waiting for me for 4 hours, & I let it slip by. Sigh. Sooooo - you did what should be done on one's 2-day birthday, Keith - Just whatever pleases you! Good maeN, good people. Happy birthday again, Keith. And Wombat, about the ease of your poozle, what Kathy said. Now I shall send in my answers. That done I shall skip the sudoku until the morning. There was indeed a tornado south of here, with at least one person killed in Richmond VA, but luckily (?) all we have up here is continued rain, currently a loud downpour but at times just light mist. We are well beyond the record for rain in September, since we reached the record for a month over a week ago. OOO thunder! noisy! Month after month, we set records for rain. Not a good thing. Afternoon everyone, tried doing the puzzle this morning only to have the iPad battery go flat. Have been charging it as we traveled. Hey it wasn't me who said the poozle was easy, and of course you can expect to have to use Google, I certainly do. Squires 150 lashes would do the trick. Glug, glug. In fact as I have just sold my Austin 7, it should probably be champagne. But on further consideration as it is Mrs. Wombat's birthday tomorrow we might keep it until then. Look on the positive side, Wombat. Have two.